Vail, Colorado is not only one of the biggest ski areas in the world, but is also one of the most popular overseas destinations for Australian skiers and boarders. Easily accessible from Denver, a trip to Vail offers skiers of all standards plenty of options and plenty of challenges. Throw in the smaller resorts of Beaver Creek and Arrowhead and the Vail Valley has more terrain than most other areas in North America. However, with that much terrain it is easy to get lost or to miss out on some of the Vail Valley’s hidden gems. It is also easy to dismiss Vail as big and brassy, so we decided to get a local’s perspective on what makes the place. 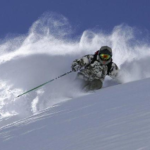 Who better to ask than Chris Anthony, pro big mountain skier, Alaskan heli-guide, star of 16 Warren Miller films and a Vail local since he was kid? The Soul of the Vail Valley lies deeper in the threading of the environment than what first presents itself to the visitors rolling into the interstate crossed valley. It is deeper than the nametags, parking structure and beyond the signage. Vail’s soul is found in the owner-operated bars, restaurants, stores, hotels and with the long-time locals. It is between the marked runs and off the trail map. Vail Mountain alone is massive with 5289 acres of skiable terrain, making Vail the largest ski mountain in North America. All of Aspen’s 673 acres could very nearly squeeze into Vail’s latest expansion “Blue Sky Basin” which alone is 645 acres. 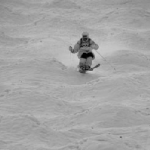 Knowing how to ski and visit Vail is what will turn the experience from a day lost to one of pure exhausting fun. The Valley’s skiable terrain, with Beaver Creek and Arrowhead included, is over 20 miles long and 10 miles deep. This means that one part of the valley may have created it’s own storm system, dumping several inches of snow, while other portions of the valley remain under blue skies. Work the valley right, and there is no way you will leave without an epic skiing experience, in bounds or out. Talking about out-of-bounds skiing, the options are amazing. Travelling out of bounds through one of the access gates into the backcountry with a knowledgeable local is key. You can meet one at one of the local watering holes, like “Vendetta’s”, the patrols’ favourite hang out in Vail. Aussies and Kiwis attract the locals like flies to flypaper – thanks to the long time good beer drinking relationships between the two cultures. If the right local is befriended several thousand more acres can be added into the skiing experience menu. They will entertain you with the true rewards that a little hiking and a few beers can buy. If you are lucky, some untracked and steeper terrain (riddled with cliffs the Vail brochures don’t advertise) will be handed to you on a silver platter. They will take you where stupidity is punished and knowledge is respected. This is the backcountry where beacons, probes and shovels are standard gear and respect for environment is king. Chris Anthony drops a cliff in the East Vail chutes. One of the more popular off-the-map adventures is descending off the back of Vail down into the old mining town of Minturn, known locally as the Minturn Mile. The upper section of this now infamous off piste runs beyond the access gates in “Game Creek Bowl” is made up of open glades and several different facing aspects. The mainline down the centre faces west and holds its own for fresh tracks. The south facing slopes on a nice cold mid-winter powder day consist of aspen trees and plenty of room to play on a fairly nice pitch for speed. If the sun cooks it too much and makes the snow a little tricky moving to the north facing slopes is the best option. The North facing descents are a little shorter and tighter but what is there is well worth it. At the bottom of the steeps is where the fun really begins with the luge trail leading out for a couple of miles to Minturn. Traditionally the start of the luge is a place to stop and have a shot of Grappa before racing down the narrows into the town of Minturn. On a good powder day it is possible to make it all the way to my favourite Mexican restaurant, the Minturn Saloon where Bruce mixes in a strong tequila with the Margarita mix for a bit of après ski reward. Make this an end of the day treat and then catch a bus or cab back to Vail before the bars close for the night. Back in Vail the Red Lion becomes the hotspot with Phil Long at the helm of entertainment. The singer was able to collect enough tip money and find a couple of investors so he could buy the bar he sings in every night from the original owners. The tourist women flock to the place like he is Mick Jagger or something. The bar serves up a rocket fuel of Go Fast mixed with Tuaca that can carry you through the night, but also into the next day with energy to spare. Located 10 miles to the west of Vail is the posh resort of Beaver Creek and its’ hidden core of community. “The Beav” is known for its easy access to tree runs, log slides, long vertical steeps and lack of crowds. Beaver Creek is skied, but rarely ever truly appreciated because of its posh image when, in fact, the place rocks. In Beaver Creek high-speed lifts carry you directly to the destination with out too much extra hiking or traversing to the goods. The powder usually sticks around because the wealthy destination-skier staying in the immediate hotels do not have the skills to ski the stuff. The trick to Beaver Creek is heading to an area called Grouse Mountain and skiing off the backside into the glades. After a good storm the glades provide some of the best lift-served backcountry terrain in the valley. Left in their natural state, the glades are made up of a series of avalanche shoots that have to be controlled through skier impact and some hard work by the Beaver Creek patrol. A good place to meet the patrol off duty is at the Local’s watering hole, the Coyote Café. Most of the guys have been around for several years and will be more than happy to point you in the right direction for the next day over a few beers. I can do the same.